What is the St. Patrick's Starlight Hotel Choir? The St. Patrick's Starlight Hotel Choir is a community-based choir, with a particular emphasis on those who are isolated and those at risk of homelessness. Notwithstanding this primary intent, it is open to anyone and has a major focus on theraputic benefits of singing. The Choir aims to create a fun, non-threatening environment for people to express themselves, feel a part of a team and have a great time singing the songs they love! At the time of the Choir’s formation, one of the participants commented that he slept most nights “in the Starlight Hotel”. The name has stuck. The Choir operates under the auspices of St Pats community support centre, an NGO that delivers essential services for people who are homeless or at risk of being homeless. The support centre offers the Choir administrative support, a rehearsal venue, transport, insurance and tax-free charity status. The Choir runs two sessions a week with the 2nd session having a song writing/ creative writing focus. What is the purpose of the Choir? It comes as no surprise that one of the key factors contributing to poor mental health and depression, is isolation. Mental health issues are, in turn, a major contributing factor to ongoing homelessness. The Choir provides an ideal environment to bring people together through a fun activity in which everyone can participate, resulting in a strong sense of camaraderie amongst participants and a safe place for people to express themselves. This was at the core of the Choir’s establishment and remains as such to current date. The Choir is made up of people who utilise the homeless centre, but is also open to the general community and utilised by other disability organisations. There can be up to 50 singers at some of the weekly sessions, certainly changing the mood of the homeless centre for the better! The Choir also connects with the broader community via its performances. 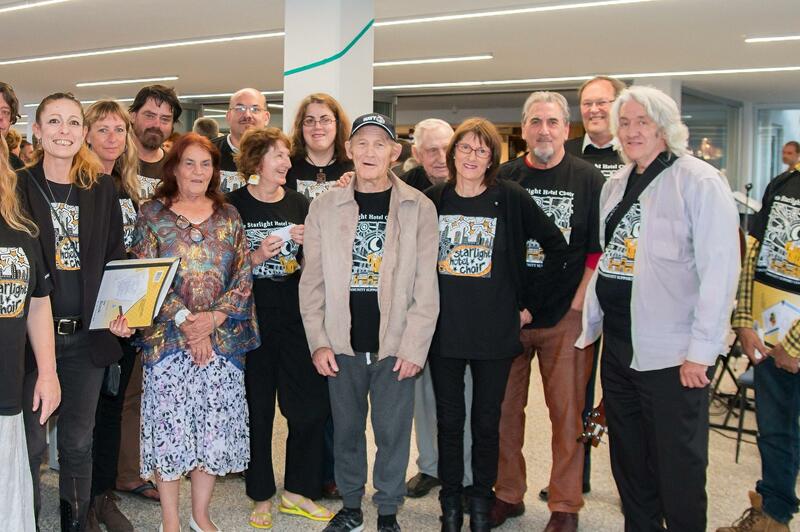 Last year the Choir undertook over 20 performances in venues varying from hospitals, schools and homes for the ageing, to the Perth Concert Hall. What does the Choir’s future hold? The SHC has been running this service for vulnerable and at-risk people for over 12 years now. We are just coming to the end of a funding period from the Mental Health Commission and are on the lookout for further sponsorship and funding. The program costs $28,000 a year which basically covers 12 facilitating hours a week. We are hopeful to continue in the future and have some very positive things to look forward to, such as the recording of our 3rd album, more performances or simply making someone feel a little more confident and happy within themselves. We have been fortunate to have the support of our wonderful partners MiCasa Property Boutique and the Soroptimists of Fremantle, who together have contributed $4000 to our cause.